Spending two weeks in India was an incredibly eye-opening experience for us. The local way of life on the streets was beautiful yet hectic- a complete contrast from what we had been used to in the United States. We saw beautiful palaces and the incredible Taj Mahal, but this also contrasted with the extreme poverty with poor sanitation and living standards we encountered on the streets. Riding around in rickshaws was the fastest mode of transport to get through the narrow alleyways, past the cows, donkeys and goats that often would share the roadway with traffic. 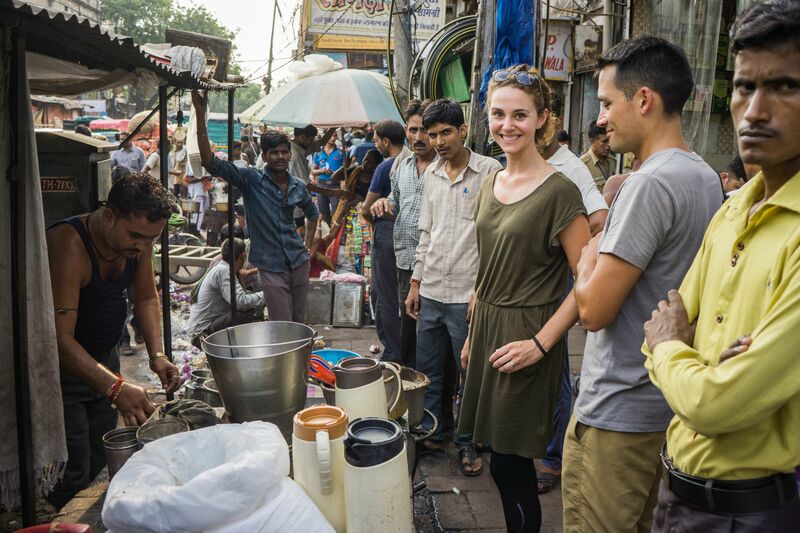 Taking a cooking class and a bike tour was a way for us to directly interact with locals in their houses and learn firsthand about their way of life. Natalie loved stopping at the Masala Chai vendors for a 10 rupee cup of pure Indian deliciousness. Humayun's Tomb in Delhi was one of Natalie's favorite sites. Our itinerary focused on the Golden Triangle (Delhi, Agra, Jaipur) and also Rajasthan. (Udaipur and Jodphur). We opted to tour the country on our own, which allowed us more freedom to see the country from trains, buses, rickshaws, taxis, bikes, boats, and walking. The start of our trip was in chaotic Delhi- you could feel the heartbeat of the city once you entered Old Delhi. This is the India we envisioned from what we had seen and heard about from the media. Busy, loud streets filled with merchants mixed in with beautiful palaces and sites. 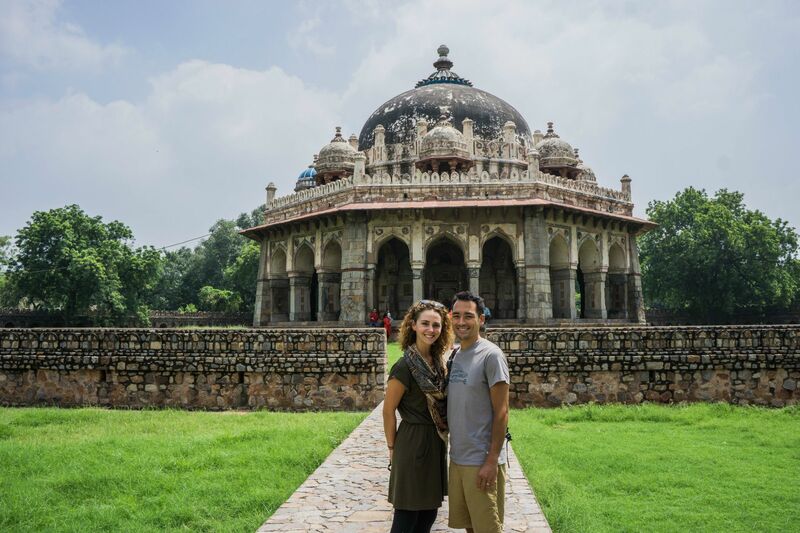 We opted for a guided day tour to see Huyamun’s Tomb (a highlight for Natalie and this building was the inspiration for the Taj Mahal), the Lotus Temple (a Bahai house of worship for all faiths), the Red Fort and many other sites. Delhi is definitely worth seeing for at least one day. The markets of Old Delhi may be chaotic, but we loved the Masala Chai. Seeing the Taj Mahal was the reason for our trip to Agra. 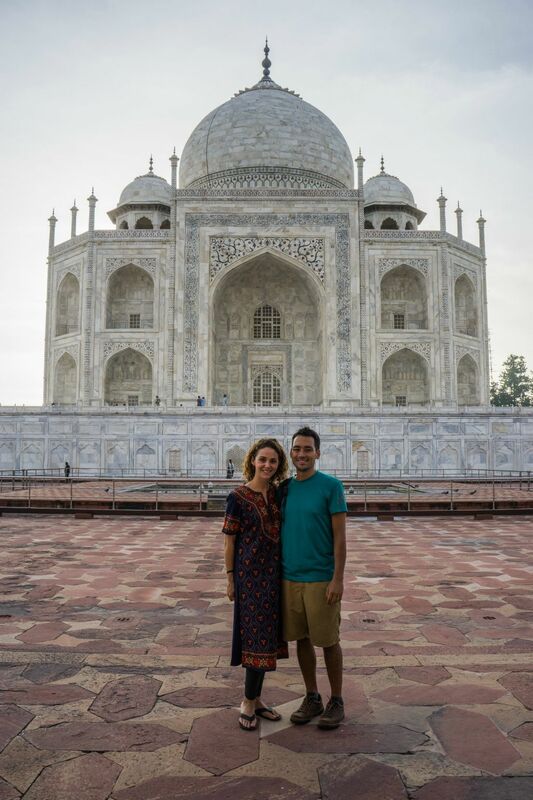 The Taj was beautiful, we went for sunrise which was a great way to start the day. We had a great rickshaw driver named Anil who was our “go-to” transport authority that we used during the trip. 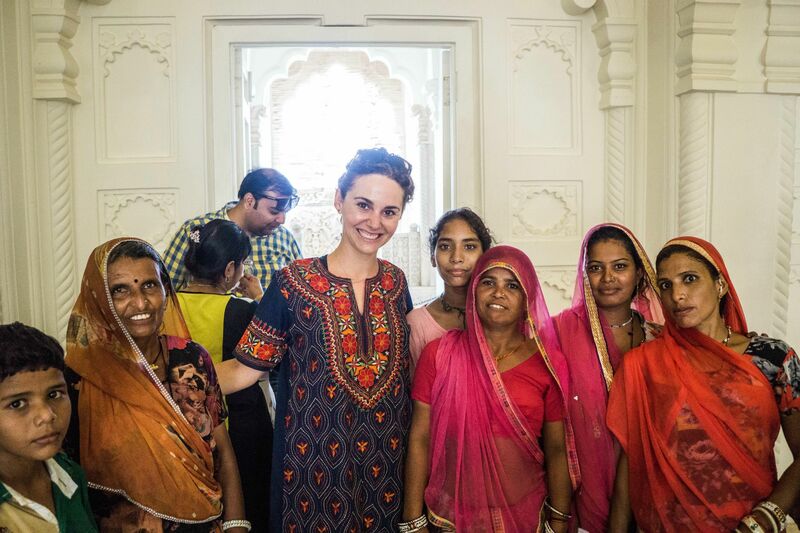 The people were very friendly in Agra, and due to us traveling in August, we felt like the only tourists in the city which was unexpected and made it more interesting. However, Agra actually surprised us in how dirty it felt compared to the other cities of India that we went to. The Taj Mahal in Agra was stunningly beautiful. The rest of beautiful Rajasthan was beckoning for us to see it and we took the sleeper train to Udaipur. Even though we took a first class train, it was still an awakening experience for us and we recommend taking the train in India at least once if you can. Udaipur is a beautiful city – it has an ornate palace on one of the man-made lakes with the beautiful mountains in the background. Udaipur was Josh’s favorite city. There are many rooftop restaurants with great views and we took a cooking class with Shashi which was one of the highlights of our trip. We learned how to make Masala Chai, Chapati, Naan, Curry, Pakora, Chutney and many other traditional foods from Rajasthan. It was interesting learning about Shashi’s story regarding her difficult life journey and struggles she went through until 2 Irish tourists helped her make a website for her cooking class, which is now rated #1 on Tripadvisor and made our trip to Udaipur very memorable. Overlooking Lake Pichola in Udaipur. 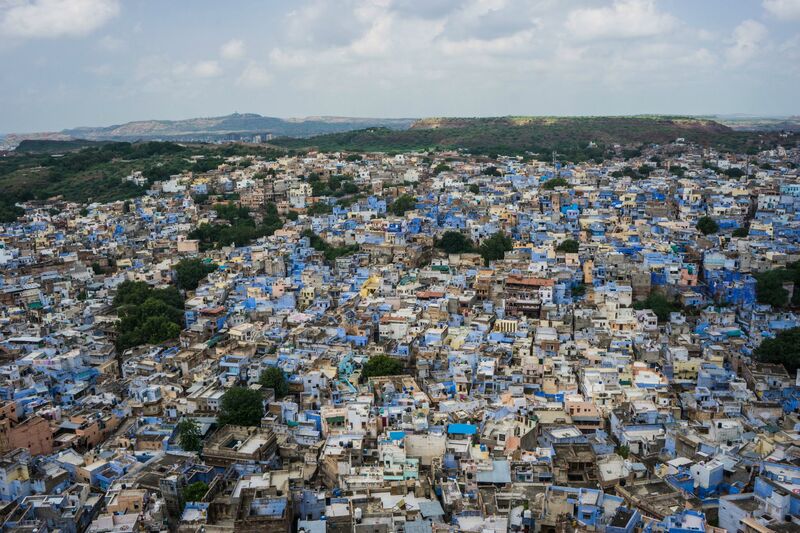 View atop the Mehrangarh Fort, overlooking the "Blue City" of Jodhpur. Jodhpur was Natalie’s favorite city. The blue houses surround the Mehrangarh Fort, which is elevated by beautiful red rock. We stayed in the heart of the city in a traditional Haveli, near the clock tower and markets. A highlight of our trip was taking a day trip to a nearby town Osian and going on a camel safari in the desert. It was nice to get out of the hustle and bustle of the city for a day and enjoy the beautiful surroundings of elevated red rock within the desert. We were also lucky to pass by thousands of Indian people on a 500km + pilgrimage while we were on our day trip to Osian and also during our shuttle bus drive from Udaipur to Jodhpur. Now we know what it feels like to be Bollywood celebrities, too! Since we crossed paths many Indians from rural areas while on their pilgrimage route in the small town of Osian, we posed for numerous photos as they had never seen Westerners before. One of Natalie's many photos with locals, she was a celebrity! The last city on our trip was Jaipur, the Pink City. We used SPG points to stay for free at the ITC Rajputana and we felt like royalty at this incredible hotel! In Jaipur, we saw the magnificent Amber Fort and Natalie had a local henna/mendi artist make her left hand look like a work of art for the 2 weeks it lasted on her hand. The highlight and most eye-opening part of our stay in Jaipur was our bicycle tour with Cyclin’ Jaipur Tours. We biked through the heart of Jaipur, seeing the crowded vegetable market, a local curry and Kheer (buffalo milk dessert) kitchen, a marble worker’s quarters and a local dairy family’s house. When we entered the local family’s home in the heart of the bustling city of Jaipur, we walked past 5 cows in their interior hallway before walking upstairs to their 2 room apartment for five people- approximately 25 square meters. The kitchen was also the bathroom. The other room contained one straw mat and one plastic outdoor chair- this was the sleeping and living quarters for five family members. The family was very welcoming and we enjoyed every moment of our time with them, we will never forget this bicycle tour in Jaipur. Thank you Cyclin’ Jaipur for this incredible opportunity to see and experience a local part of Jaipur as we would have never been able to experience this on our own. We will never forget the warmth of the people of India and we will be back. Please watch our video to see what we have seen during the two week tour of the Golden Triangle and Rajasthan! 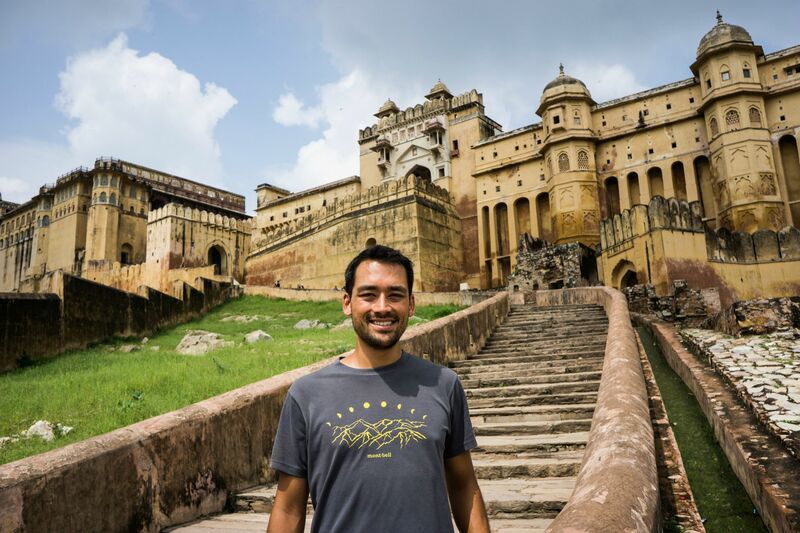 Visiting the Amber Fort, in Jaipur.